IdeaPaint is the first patented dry erase paint, the category inventor, and the industry gold standard. It was a long and winding road to success, and now the company is taking another leap forward with a new Shopify store. Founded in 2002 by several Babson College students, IdeaPaint was conceived when the young entrepreneurs grew frustrated with covering their dorm walls in paper to write down their business ideas. As the paper became filled with writing, they had to tear it down and replace it with new sheets. The situation drove them to seek out a paint that could turn their dorm walls into dry erase writing surfaces - but no product existed. The idea for IdeaPaint was born. Their previous WooCommerce online store was holding the company back from quickly and easily responding to their customers’ needs and interests. It was too complicated to edit products and collections, they didn’t feel in control of their marketing integrations, and had to rely on developers for simple day-to-day updates and site management. We implemented an improved Shopify site to make overall eCommerce easier to manage and better on the customer experience side. One of our favorite customizations is the custom quantity calculator. The customer types in the square footage of the space they need to paint, and the tool automatically calculates the increments of paint needed to maximize the price points. It makes it easier on the customer than trying to figure it out on their own. 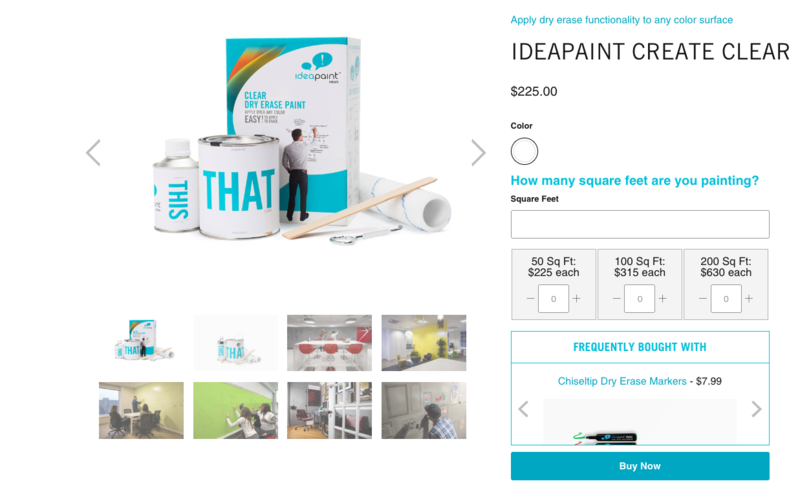 The new IdeaPaint Shopify site launched in early October 2018, and now we’re working together on phase two - adding more promotional tools to make it easier, faster, and more strategic for IdeaPaint to experiment with different sales markets and channels, and test out different promotional strategies.